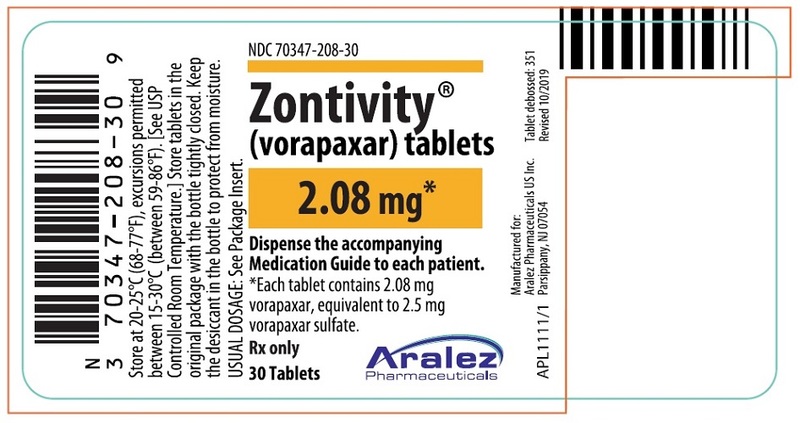 Packager: Aralez Pharmaceuticals Us Inc.
Do not use ZONTIVITY in patients with a history of stroke, transient ischemic attack (TIA), or intracranial hemorrhage (ICH); or active pathological bleeding [see CONTRAINDICATIONS (4.1, 4.2)]. Antiplatelet agents, including ZONTIVITY, increase the risk of bleeding, including ICH and fatal bleeding [see Warnings and Precautions (5.1)]. These highlights do not include all the information needed to use ZONTIVITY safely and effectively. See full prescribing information for ZONTIVITY. To report SUSPECTED ADVERSE REACTIONS, contact Aralez Pharmaceuticals at 1-866-207-6592 or FDA at 1-800-FDA-1088 or www.fda.gov/medwatch. ZONTIVITY® is indicated for the reduction of thrombotic cardiovascular events in patients with a history of myocardial infarction (MI) or with peripheral arterial disease (PAD). ZONTIVITY has been shown to reduce the rate of a combined endpoint of cardiovascular death, MI, stroke, and urgent coronary revascularization (UCR). Take one tablet of ZONTIVITY 2.08 mg orally once daily, with or without food. There is no experience with use of ZONTIVITY alone as the only administered antiplatelet agent. ZONTIVITY has been studied only as an addition to aspirin and/or clopidogrel. Use ZONTIVITY with aspirin and/or clopidogrel according to their indications or standard of care [see Clinical Studies (14)]. There is limited clinical experience with other antiplatelet drugs. ZONTIVITY tablets, 2.08 mg vorapaxar, are yellow, oval-shaped, film-coated tablets with "351" on one side and the Merck logo on the other side. ZONTIVITY is contraindicated in patients with a history of stroke, TIA, or ICH because of an increased risk of ICH in this population [see Adverse Reactions (6)]. Discontinue ZONTIVITY in patients who experience a stroke, TIA, or ICH [see Adverse Reactions (6.1) and Clinical Studies (14)]. ZONTIVITY is contraindicated in patients with active pathological bleeding such as ICH or peptic ulcer [see Warnings and Precautions (5.1) and Adverse Reactions (6.1)]. Antiplatelet agents, including ZONTIVITY, increase the risk of bleeding, including ICH and fatal bleeding [see Adverse Reactions (6.1)]. ZONTIVITY increases the risk of bleeding in proportion to the patient's underlying bleeding risk. Consider the underlying risk of bleeding before initiating ZONTIVITY. General risk factors for bleeding include older age, low body weight, reduced renal or hepatic function, history of bleeding disorders, and use of certain concomitant medications (e.g., anticoagulants, fibrinolytic therapy, chronic nonsteroidal anti-inflammatory drugs [NSAIDS], selective serotonin reuptake inhibitors, serotonin norepinephrine reuptake inhibitors) increases the risk of bleeding [see Use in Specific Populations (8.7) and Clinical Pharmacology (12.3)]. Avoid concomitant use of warfarin or other anticoagulants. Suspect bleeding in any patient who is hypotensive and has recently undergone coronary angiography, percutaneous coronary intervention (PCI), coronary artery bypass graft surgery (CABG), or other surgical procedures. Withholding ZONTIVITY for a brief period will not be useful in managing an acute bleeding event because of its long half-life. There is no known treatment to reverse the antiplatelet effect of ZONTIVITY. Significant inhibition of platelet aggregation remains 4 weeks after discontinuation [see Overdosage (10) and Clinical Pharmacology (12.2, 12.3)]. Strong CYP3A inhibitors increase and inducers decrease ZONTIVITY exposure. Avoid concomitant use of ZONTIVITY with strong CYP3A inhibitors or inducers [see Drug Interactions (7.1) and Clinical Pharmacology (12.3)]. Bleeding [see Boxed Warning and Warnings and Precautions (5.1)]. 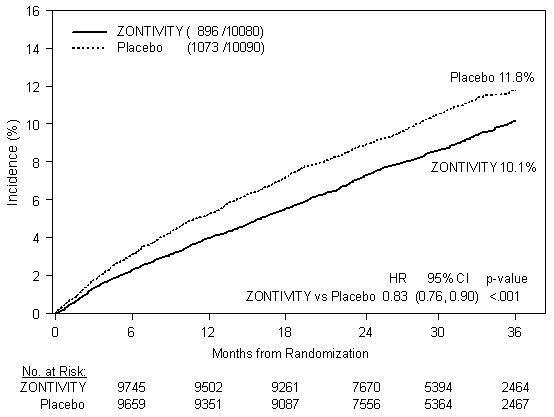 ZONTIVITY was evaluated for safety in 13,186 patients, including 2,187 patients treated for more than 3 years, in the Phase 3 study TRA 2°P TIMI 50 (Thrombin Receptor Antagonist in Secondary Prevention of Atherothrombotic Ischemic Events). The overall study population, patients who had evidence or a history of atherosclerosis involving the coronary (post-MI), cerebral (ischemic stroke), or peripheral vascular (documented history of PAD) systems, was treated once a day with ZONTIVITY (n=13,186) or placebo (n=13,166). Patients randomized to ZONTIVITY received treatment for a median of 2.3 years. 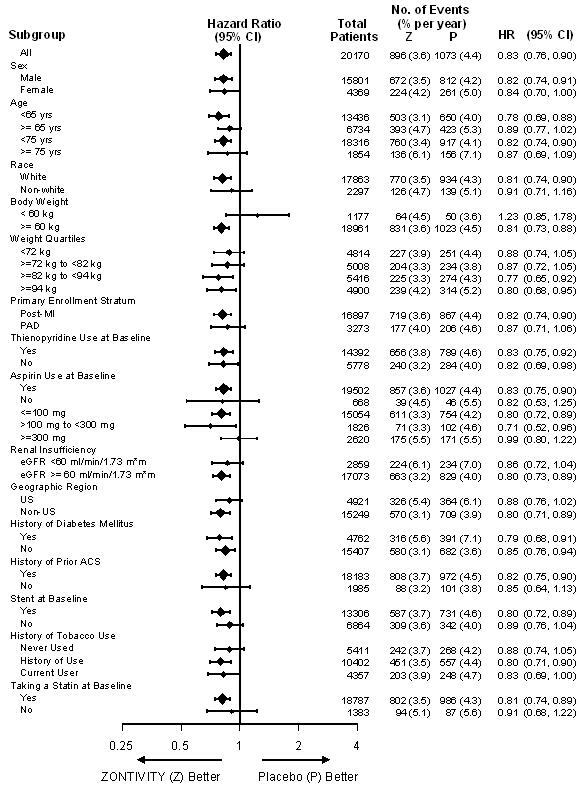 The adverse events in the ZONTIVITY-treated (n=10,059) and placebo-treated (n=10,049) post-MI or PAD patients with no history of stroke or TIA are shown below [see Contraindications (4)]. The results for the bleeding endpoints in the post-MI or PAD patients without a history of stroke or TIA are shown in Table 1. ZONTIVITY increased GUSTO moderate or severe bleeding by 55%. K-M estimate at 1,080 days. Clinically significant bleeding includes any bleeding requiring medical attention including ICH, or clinically significant overt signs of hemorrhage associated with a drop in hemoglobin (Hgb) of ≥3 g/dL (or, when Hgb is not available, an absolute drop in hematocrit (Hct) of ≥9%). Hazard ratio is ZONTIVITY group vs. placebo group. The effects of ZONTIVITY on bleeding were examined in a number of subsets based on demographic and other baseline characteristics. Many of these are shown in Figure 1. Such analyses must be interpreted cautiously, as differences can reflect the play of chance among a large number of analyses. In TRA 2°P, 367 post-MI or PAD patients without a history of stroke or TIA underwent CABG surgery. Study investigators were encouraged not to discontinue treatment with study drug (i.e., ZONTIVITY or placebo) prior to surgery. Approximately 12.3% of patients discontinued ZONTIVITY more than 30 days prior to CABG. The relative risk for GUSTO moderate or severe bleeding was approximately 1.2 on ZONTIVITY vs. placebo. Bleeding events that occurred on ZONTIVITY were treated in the same manner as for other antiplatelet agents. In the TRA 2°P study, patients with a history of ischemic stroke had a higher rate for ICH on ZONTIVITY than on placebo. ZONTIVITY is contraindicated in patients with a history of stroke, TIA, or ICH [see Contraindications (4)]. Adverse reactions other than bleeding were evaluated in 19,632 patients treated with ZONTIVITY [13,186 patients in the TRA 2°P study and 6,446 patients in the TRA•CER (Thrombin Receptor Antagonist for Clinical Event Reduction in Acute Coronary Syndrome) study]. 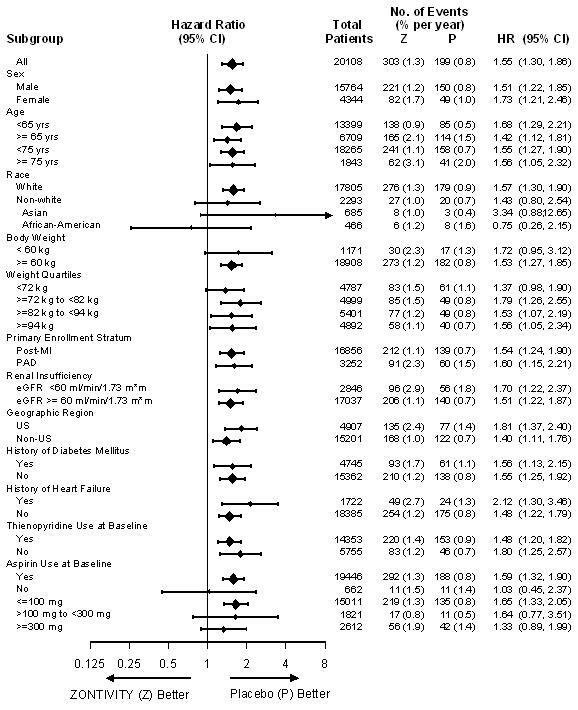 Adverse events other than bleeding that occurred at a rate that was at least 2% in the ZONTIVITY group and also 10% greater than the rate in the placebo group are shown in Table 2. The following adverse reactions occurred at a rate less than 2% in the ZONTIVITY group but at least 40% greater than placebo. In descending order of rate in the ZONTIVITY group: iron deficiency, retinopathy or retinal disorder, and diplopia/oculomotor disturbances. An increased rate of diplopia and related oculomotor disturbances was observed with ZONTIVITY treatment (30 subjects, 0.2%) vs. placebo (10 subjects, 0.06%). While some cases resolved during continued treatment, information on resolution of symptoms was not available for some cases. Vorapaxar is eliminated primarily by metabolism, with contributions from CYP3A4 and CYP2J2. Avoid concomitant use of ZONTIVITY with strong inhibitors of CYP3A (e.g., ketoconazole, itraconazole, posaconazole, clarithromycin, nefazodone, ritonavir, saquinavir, nelfinavir, indinavir, boceprevir, telaprevir, telithromycin and conivaptan) [see Warnings and Precautions (5.2) and Clinical Pharmacology (12.3)]. Avoid concomitant use of ZONTIVITY with strong inducers of CYP3A (e.g., rifampin, carbamazepine, St. John's Wort and phenytoin) [see Warnings and Precautions (5.2) and Clinical Pharmacology (12.3)]. There are no adequate and well-controlled studies of ZONTIVITY use in pregnant women. Based on data in rats and rabbits, ZONTIVITY is predicted to have a low probability of increasing the risk of adverse developmental outcomes above background. No embryo/fetal toxicities, malformations or maternal toxicities were observed in rats exposed during gestation to 56 times the human systemic exposure at the recommended human dose (RHD). No embryo/fetal toxicities, malformations or maternal toxicities were observed in rabbits exposed during gestation to 26 times the human systemic exposure at the RHD. The No Adverse Effect Level (NOAEL) for decreased perinatal survival and body weight in off-spring exposed in utero and during lactation was 31 times the human systemic exposure at the RHD. Both male and female pups displayed transient effects on sensory function and neurobehavioral development at weaning at 67 times the human exposure at the RHD, whereas female pups displayed decreased memory at 31 times the human exposure at the RHD. However, animal studies are not always predictive of a human response. ZONTIVITY should be used during pregnancy only if the potential benefit to the mother justifies the potential risk to the fetus. In the rat embryo/fetal developmental toxicity study, pregnant rats received daily oral doses of vorapaxar at 0, 5, 25, and 75 mg/kg from implantation to closure of the fetal hard palate (6th to 17th day of gestation). Maternal systemic exposures were approximately 0, 7, 56, and 285 times greater than exposures in women treated at the RHD based on AUC. No embryo/fetal toxicities, malformations, or maternal toxicities were observed in rats receiving exposures up to 56 times the human systemic exposure at the RHD. In the rabbit embryo/fetal developmental toxicity study, pregnant rabbits received daily oral doses of vorapaxar at 0, 2, 10, or 20 mg/kg from implantation to closure of the fetal hard palate (7th to 19th day of gestation). The NOAEL for maternal and fetal toxicity was equal to or above the highest dose tested. However, an overall increase in the number of litters with any malformation was observed at the highest dose, where systemic exposures were 89-fold higher than the human exposure at RHD. The effects of vorapaxar on prenatal and postnatal development were assessed in pregnant rats dosed at 0, 5, 25, or 50 mg/kg/day from implantation through the end of lactation. Rat pups had decreased survival and body weight gain from birth to postnatal day 4 and decreased body weight gain for the overall pre-weaning period at exposures 67 times the human exposure at the RHD. Both male and female pups displayed effects on sensory function (acoustic startle) and neurobehavioral (locomotor assay) development on post-natal day (PND) 20 and 21, but not later (PND 60, 61) in development, whereas decreased memory was observed in female pups on PND 27 at 31 times the human exposure at the RHD. In utero and lactational exposure did not affect fertility or reproductive behavior of offspring at exposures up to 67 times the RHD. It is unknown whether vorapaxar or its metabolites are excreted in human milk, but it is actively secreted in milk of rats. Because many drugs are excreted in human milk, and because of the potential for serious adverse reactions in nursing infants from ZONTIVITY, discontinue nursing or discontinue ZONTIVITY. The safety and effectiveness of ZONTIVITY in pediatric patients have not been established. In TRA 2°P, in post-MI or PAD patients without a history of stroke or TIA, 33% of patients were ≥65 years of age and 9% were ≥75 years of age. The relative risk of bleeding (ZONTIVITY compared with placebo) was similar across age groups. No overall differences in safety or effectiveness were observed between these patients and younger patients. ZONTIVITY increases the risk of bleeding in proportion to a patient's underlying risk. Because older patients are generally at a higher risk of bleeding, consider patient age before initiating ZONTIVITY [see Adverse Reactions (6.1)]. No dose adjustment is required in patients with mild and moderate hepatic impairment. Based on the increased inherent risk of bleeding in patients with severe hepatic impairment, ZONTIVITY is not recommended in such patients [see Warnings and Precautions (5.1) and Clinical Pharmacology (12.3)]. There is no known treatment to reverse the antiplatelet effect of ZONTIVITY, and neither dialysis nor platelet transfusion can be expected to be beneficial if bleeding occurs after overdose. Inhibition of platelet aggregation can be expected for weeks after discontinuation of normal dosing [see Clinical Pharmacology (12.2)]. There is no standard test available to assess the risk of bleeding in an overdose situation. ZONTIVITY contains vorapaxar sulfate, a tricyclic himbacine-derived selective inhibitor of platelet aggregation mediated by PAR-1. Vorapaxar sulfate is a white to off-white solid. Vorapaxar sulfate is freely soluble in methanol and slightly soluble in ethanol, acetone, 2-propanol, and acetonitrile. In aqueous solution, it is slightly soluble in pH 1; its solubility decreases with increasing pH. ZONTIVITY tablets are formulated with vorapaxar sulfate, but during manufacture and storage, partial conversion from vorapaxar sulfate to vorapaxar free base may occur. ZONTIVITY is available for oral use as tablets containing 2.08 mg of vorapaxar, which is equivalent to 2.5 mg of vorapaxar sulfate. Each film-coated tablet of ZONTIVITY contains the following inactive ingredients: lactose monohydrate, microcrystalline cellulose, croscarmellose sodium, povidone, and magnesium stearate. In addition, the film coating contains the following inactive ingredients: lactose monohydrate, hypromellose, titanium dioxide, triacetin (glycerol triacetate), and iron oxide yellow. Vorapaxar is a reversible antagonist of the protease-activated receptor-1 (PAR-1) expressed on platelets, but its long half-life makes it effectively irreversible. Vorapaxar inhibits thrombin-induced and thrombin receptor agonist peptide (TRAP)-induced platelet aggregation in in vitro studies. Vorapaxar does not inhibit platelet aggregation induced by adenosine diphosphate (ADP), collagen or a thromboxane mimetic and does not affect coagulation parameters ex vivo. PAR-1 receptors are also expressed in a wide variety of cell types, including endothelial cells, neurons, and smooth muscle cells, but the pharmacodynamic effects of vorapaxar in these cell types have not been assessed. At the recommended dose, ZONTIVITY achieves ≥80% inhibition of TRAP-induced platelet aggregation within one week of initiation of treatment. The duration of platelet inhibition is dose- and concentration-dependent. Inhibition of TRAP-induced platelet aggregation at a level of 50% can be expected at 4 weeks after discontinuation of daily doses of ZONTIVITY 2.08 mg, consistent with the terminal elimination half-life of vorapaxar [see Clinical Pharmacology (12.3)]. In healthy volunteer studies, no changes in platelet P-selectin and soluble CD40 ligand (sCD40L) expression or coagulation test parameters (TT, PT, aPTT, ACT, ECT) occurred after single- or multiple- dose (28 days) administration of vorapaxar. No meaningful changes in P-selectin, sCD40L, or hs-CRP concentrations were observed in patients treated with vorapaxar in the phase 2/3 clinical trials. The effect of vorapaxar on the QTc interval was evaluated in a thorough QT study and in other studies. Vorapaxar had no effect on the QTc interval at single doses up to 48 times the recommended dose. Vorapaxar exposure increases in an approximately dose-proportional manner following single doses up to 16 times the recommended dose. Vorapaxar pharmacokinetics are similar in healthy subjects and patients. After oral administration of a single ZONTIVITY 2.08 mg dose under fasted conditions, peak concentrations (Cmax) occur at 1 hour post-dose (range: 1 to 2 h). The mean absolute bioavailability as determined from a microdosing study is approximately 100%. Ingestion of vorapaxar with a high-fat meal resulted in no meaningful change in AUC with a small (21%) decrease in Cmax and delayed time to peak concentration (45 minutes). ZONTIVITY may be taken with or without food. The mean volume of distribution of vorapaxar is approximately 424 liters (95% CI: 351-512). Vorapaxar and the major circulating active metabolite, M20, are extensively bound (≥99%) to human plasma proteins. Vorapaxar is highly bound to human serum albumin and does not preferentially distribute into red blood cells. Vorapaxar is eliminated by metabolism via CYP3A4 and CYP2J2. 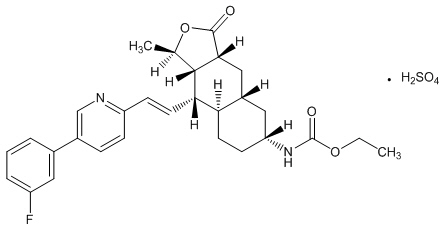 The major active circulating metabolite is M20 (monohydroxy metabolite) and the predominant metabolite identified in excreta is M19 (amine metabolite). The systemic exposure of M20 is ~20% of the exposure to vorapaxar. The primary route of elimination is through the feces. In a 6-week study, 84% of the administered radiolabeled dose was recovered as total radioactivity with 58% collected in feces and 25% in urine. Vorapaxar is eliminated primarily in the form of metabolites, with no unchanged vorapaxar detected in urine. Vorapaxar exhibits multi-exponential disposition with an effective half-life of 3-4 days and an apparent terminal elimination half-life of 8 days. Steady-state is achieved by 21 days following once-daily dosing with an accumulation of 5- to 6-fold. The apparent terminal elimination half-life for vorapaxar is approximately 8 days (range 5-13 days) and is similar for the active metabolite. The terminal elimination half-life is important to determine the time to offset the pharmacodynamic effect [see Clinical Pharmacology (12.2)]. The effects of intrinsic factors on the pharmacokinetics of vorapaxar are presented in Figure 2 [see Use in Specific Populations (8.5, 8.6, 8.7)]. 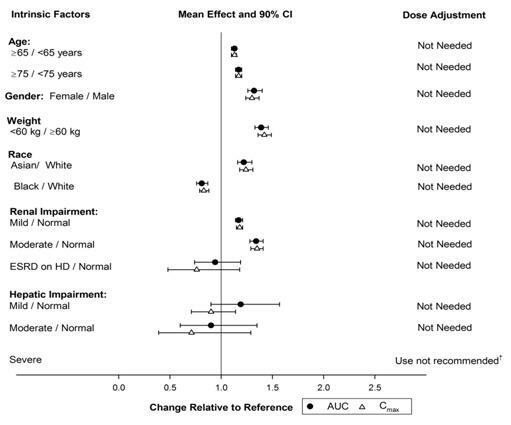 In general, effects on the exposure of vorapaxar based on age, race, gender, weight, and moderate renal insufficiency were modest (20-40%; see Figure 2). No dose adjustments are necessary based upon these factors. Because of the inherent bleeding risks in patients with severe hepatic impairment, ZONTIVITY is not recommended in such patients [see Warnings and Precautions (5.1) and Use in Specific Populations (8.7)]. An interaction study with vorapaxar and warfarin in healthy subjects did not demonstrate a clinically significant pharmacokinetic or pharmacodynamic interaction [see Warnings and Precautions (5.1) and Figure 4]. Vorapaxar did not affect prasugrel pharmacokinetics and prasugrel did not affect vorapaxar pharmacokinetics following multiple-dose administration at steady-state [see Warnings and Precautions (5.1) and Figures 3 and 4]. The pharmacokinetic interaction between vorapaxar and clopidogrel has not been evaluated. However, the use of vorapaxar on a background of clopidogrel is supported by the clinical data from TRA 2°P and TRA•CER [see Adverse Reactions (6.1) and Clinical Studies (14)]. 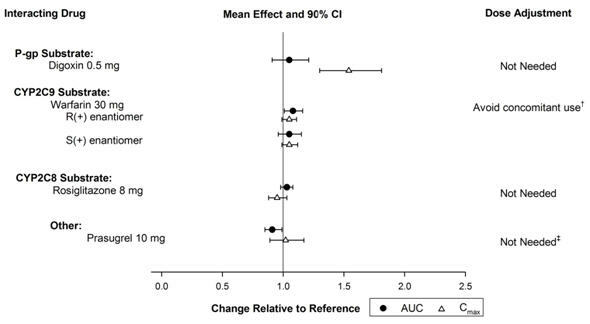 The effects of other drugs on the pharmacokinetics of vorapaxar are presented in Figure 3 as change relative to vorapaxar administered alone (test/reference). Phase 3 data suggest that coadministration of a weak or moderate CYP3A inhibitor with vorapaxar does not increase bleeding risk or alter the efficacy of vorapaxar. No dose adjustment for ZONTIVITY is required in patients taking weak to moderate inhibitors of CYP3A. In vitro metabolism studies demonstrate that vorapaxar or M20 is unlikely to cause clinically significant inhibition or induction of major CYP isoforms or inhibition of OATP1B1, OATP1B3, BCRP, OAT1, OAT3, and OCT2 transporters. 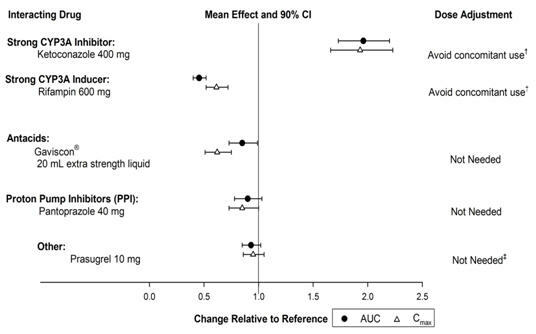 Specific in vivo effects on the pharmacokinetics of digoxin, warfarin, rosiglitazone and prasugrel are presented in Figure 4 as a change relative to the interacting drug administered alone (test/reference). Vorapaxar is a weak inhibitor of the intestinal P-glycoprotein (P-gp) transporter. No dosage adjustment of digoxin or ZONTIVITY is required. Carcinogenicity studies were conducted in rats and mice dosed orally with vorapaxar for two years. Male and female rats dosed at 0, 3, 10 or 30 mg/kg/day showed no carcinogenic potential at systemic exposures (AUC) in males and females that were 9- and 29-fold, respectively, the human systemic exposure at the RHD. In male and female mice dosed at 0, 1, 5, and 15 mg/kg/day, vorapaxar showed no carcinogenic potential at systemic exposures (AUC) that were up to 30-fold the human systemic exposure. Vorapaxar was not mutagenic in the Ames bacterial reverse mutation assay and not clastogenic in an in vitro human peripheral blood lymphocyte assay or an in vivo mouse micronucleus assay after intraperitoneal administration. Fertility studies in rats showed that vorapaxar had no effect on either male or female fertility at doses up to 50 mg/kg/day, a dose resulting in systemic exposures (AUC) in male and female rats that are 40 and 67 times, respectively, the human systemic exposure at the RHD. Vorapaxar did not increase bleeding time in non-human primates when administered alone. Bleeding time was prolonged slightly with administration of aspirin or aspirin plus vorapaxar. The combination of aspirin, vorapaxar, and clopidogrel produced significant prolongation of bleeding time. Transfusion of human platelet rich plasma normalized bleeding times with partial recovery of ex vivo platelet aggregation induced with arachidonic acid, but not induced with ADP or TRAP. Platelet poor plasma had no effect on bleeding times or platelet aggregation [see Warnings and Precautions (5.1)]. The clinical evidence for the effectiveness of ZONTIVITY is supported by TRA 2°P - TIMI 50. TRA 2°P was a multicenter, randomized, double-blind, placebo-controlled study conducted in patients who had evidence or a history of atherosclerosis involving the coronary (spontaneous MI ≥2 weeks but ≤12 months prior), cerebral (ischemic stroke), or peripheral vascular (documented peripheral arterial disease [PAD]) systems. Patients were randomized to receive daily treatment with ZONTIVITY (n=13,225) or placebo (n=13,224) in addition to standard of care. The study's primary endpoint was the composite of cardiovascular death, MI, stroke, and urgent coronary revascularization (UCR). The composite of cardiovascular death, MI, and stroke was assessed as key secondary endpoint. The median follow-up was 2.5 years (up to 4 years). The findings in all randomized patients for the primary efficacy composite endpoint show a 3-year K-M event rate of 11.2% in the ZONTIVITY group compared to 12.4% in the placebo group (hazard ratio [HR]: 0.88; 95% confidence interval [CI], 0.82 to 0.95; p=0.001). The findings for the key secondary efficacy endpoint show a 3-year Kaplan-Meier (K-M) event rate of 9.3% in the ZONTIVITY group compared to 10.5% in placebo group (HR 0.87; 95% CI, 0.80 to 0.94; p<0.001). Although TRA 2°P was not designed to evaluate the relative benefits and risks of ZONTIVITY in individual patient subgroups, patients with a history of stroke or TIA showed an increased risk of ICH. Of the patients who comprised the post-MI and PAD strata and had no baseline history of stroke or TIA,10,080 were randomized to treatment with ZONTIVITY and 10,090 to placebo. These patients were 89% Caucasian, 22% female, and 33% ≥65 years of age, with a median age of 60 years. The population included patients with diabetes (24%) and patients with hypertension (65%). Of the patients who qualified for the trial with MI without a history of stroke or TIA, 98% were receiving aspirin, 78% were receiving a thienopyridine, and 77% were receiving both aspirin and a thienopyridine when they enrolled in the trial. Of the patients who qualified for the trial with PAD without a history of stroke or TIA, 88% were receiving aspirin, 35% were receiving a thienopyridine, and 27% were receiving both aspirin and a thienopyridine when they enrolled. In post-MI or PAD patients without a history of stroke or TIA the 3-year K-M event rate for the primary efficacy endpoint (composite of time to first CV death, MI, stroke, or UCR) was 10.1% in the ZONTIVITY group compared to 11.8% in the placebo group (HR 0.83; 95% CI, 0.76 to 0.90; p<0.001) (see Figure 5 and Table 3). The results for the key secondary efficacy endpoint (composite of time to first CV death, MI, or stroke) show a 3-year K-M event rate of 7.9% in the ZONTIVITY group compared to 9.5% in the placebo group (HR 0.80; 95% CI, 0.73 to 0.89; p<0.001) (see Table 3). The effect of chronic dosing with ZONTIVITY on the primary and key secondary endpoints was maintained for the duration of the trial (median follow up 2.5 years, up to 4 years). Each patient was counted only once (first component event) in the component summary that contributed to the primary efficacy endpoint. Hazard ratio is ZONTIVITY group versus placebo group. Cox proportional hazard model with covariates treatment and stratification factors (qualifying atherosclerotic disease and planned thienopyridine use). Including patients who could have had other non-fatal events or subsequently died. In post-MI or PAD patients who survived an on-study efficacy event, the incidence of subsequent events was lower with ZONTIVITY. The time from the prior MI to randomization had no relationship to the treatment benefit for the primary study outcome. A range of demographic, concurrent baseline medications, and other treatment differences were examined for their influence on outcomes as shown in Figure 6. Such analyses must be interpreted cautiously, as differences can reflect the play of chance among a large number of analyses. Store at 20-25°C (68-77°F), excursions permitted between 15-30°C (between 59-86°F). [See USP Controlled Room Temperature.] Store tablets in the original package with the bottle tightly closed. Keep the desiccant in the bottle to protect from moisture. Store at 20-25°C (68-77°F), excursions permitted between 15-30°C (between 59-86°F). [See USP Controlled Room Temperature.] Store in the original package until use. Summarize the benefits and potential side effects of ZONTIVITY. Tell patients to take ZONTIVITY exactly as prescribed. Inform patients not to discontinue ZONTIVITY without discussing it with the prescribing physician. Tell patients to read the Medication Guide. May bleed and bruise more easily. Should report any unanticipated, prolonged or excessive bleeding, or blood in their stool or urine. Inform physicians and dentists that they are taking ZONTIVITY before any surgery or dental procedure. Tell the doctor performing any surgery or dental procedure to talk to the prescribing physician before stopping ZONTIVITY. Tell patients to list all prescription medications, over-the-counter medications, or dietary supplements they are taking or plan to take so that the physician knows about other treatments that may affect bleeding risk. Copyright © 2016 Aralez Pharmaceuticals US Inc.
Read this Medication Guide before you start taking ZONTIVITY and each time you get a refill. There may be new information. This information does not take the place of talking with your doctor about your medical condition or your treatment. What is the most important information I should know about ZONTIVITY? ZONTIVITY is used to lower your chance of having another serious problem with your heart or blood vessels, but ZONTIVITY (and similar drugs) can cause bleeding that can be serious and lead to death. vomiting blood or your vomit looks like "coffee grounds"
coughing up blood or blood clots. it will take longer than usual for any bleeding to stop. currently have unusual bleeding, such as bleeding in your head, stomach or intestines (an ulcer). If you have a stroke, TIA, or bleeding in your brain while taking ZONTIVITY your doctor should stop your treatment with ZONTIVITY. Follow your doctor's instructions about stopping ZONTIVITY. Do not stop taking ZONTIVITY without talking to the doctor who prescribed it for you. reduced blood flow in their legs (peripheral arterial disease). ZONTIVITY is used with aspirin and/or clopidogrel to lower your chance of having another serious problem with your heart or blood vessels, such as heart attack, stroke, or death. It is not known if ZONTIVITY is safe and effective in children. What should I tell my doctor before taking ZONTIVITY? are pregnant or plan to become pregnant. It is not known if ZONTIVITY will harm your unborn baby. are breastfeeding or plan to breastfeed. It is not known if ZONTIVITY passes into your breast milk. You and your doctor should decide if you will take ZONTIVITY or breastfeed. You should not do both. Tell all of your doctors and dentists that you are taking ZONTIVITY. They should talk to the doctor who prescribed ZONTIVITY for you before you have any surgery or dental procedure. Tell your doctor about all the medicines you take, including prescription and over-the-counter medicines, vitamins, dietary or herbal supplements. Taking ZONTIVITY with certain other medicines may increase your risk of bleeding and may affect how ZONTIVITY works. How should I take ZONTIVITY? Take ZONTIVITY exactly as prescribed by your doctor. Take ZONTIVITY 1 time each day. Take ZONTIVITY with or without food. Take ZONTIVITY with aspirin and/or clopidogrel as prescribed by your doctor. Do not stop taking ZONTIVITY without first talking to the doctor who prescribed it for you. If you take too much ZONTIVITY, call your doctor, or go to the nearest emergency room right away. What are the possible side effects of ZONTIVITY? See "What is the most important information I should know about ZONTIVITY?" These are not all the possible side effects of ZONTIVITY. How should I store ZONTIVITY? Store ZONTIVITY at room temperature between 68°F to 77°F (20°C to 25°C). Keep ZONTIVITY in the bottle it comes in. The ZONTIVITY bottle contains a desiccant packet to help keep your medicine dry (protect it from moisture). Keep the desiccant packet in the bottle. Do not throw away the desiccant packet. Store blister packs of ZONTIVITY in the original package it comes in. Keep ZONTIVITY and all medicines out of the reach of children. You can ask your doctor or pharmacist for information about ZONTIVITY that is written for health professionals. For more information, go to www.zontivity.com or call 1-866-207-6592. What are the ingredients in ZONTIVITY?